Trust all has been well on your journey so far, in spite of the occasional topsy turvy rides life has to offer, bringing forth some new lessons for us to glean from. We might have been born and brought up in an environment where we were kept aloof and isolated from the pain and suffering of other animals who are killed to become food on our plates. We might find many reasons to justify why its ok for us humans to kill animals or take part in the consumption of their meat, fooling ourselves to believe that is the way mankind has lived for a long time. By being part of the problem we are unconsciously intertwining our lives karmically with those of the animals, which are equally as important to the ecosystem as we are. Our continual onslaught on animals and its causative effect is a sign, a wake up call for humanity to change its ways before Earth decides to take out the trash. If we continue this destructive way of being, the spirit of Gaia will have no option left but to cleanse the negativity. Human pain is no different and no special as compared to Animals or other conscious beings who also feel emotions. The recent Earthquakes in Nepal are a sign of Mother Nature responding to the pain of thousands of animals slaughtered mercilessly to please a Goddess. What we did was displease the Earth Goddess, Gaia, Spirit of Earth. A student asked whether to be on the board of an activist group that saves animals, but sometimes employs violent tactics as a form of protest. Rinpoche gave the following advice. If you become part of an organization where humans can be killed, then that is more extreme than killing the animals, which is already so bad. Maybe it’s better not to be on the board. Rinpoche gave the following advice to center directors and students regarding animal sacrifice for a Hindu festival in Nepal. The Buddha boy wrote to the organizers asking them not to do it, but his request was rejected. It is a big Hindu festival, and now the Buddha boy is thinking to go there and try to stop it. I think unless you have special powers to display, people will not listen. It is a big religion, with not one hundred or one thousand followers, but millions. Now it seems to have become a problem in Nepal, like the problem with shoes and Hindus in Pashupati. Now, probably no matter what the reality is, they will think it is the Buddhists who are making problems. My observation shows that the Buddha boy won't be able to stop it. Possibly some animal rights organizations might be able to help, but it's not certain. If Western organizations and people like Nobel Peace laureates ask, maybe it could help, but it would need many people. It came out good to read the Golden Light Sutra one hundred times, so I have asked Kopan gompa to send some monks to read it at the stupa and make strong prayers for the sacrifice not to happen, to dedicate like that, and of course dedicate for world peace. I would like to request the centers and students to read the Golden Light Sutra and recite the Padmasambhava prayer for removing obstacles and for quick success, for the sacrifice not to happen. This needs to be done quickly as the sacrifice is happening on 24 November. Please recite any number of the Golden Light Sutra and the Padmasambhava prayer for removing obstacles and for quick success. Rinpoche gave the following advice about killing animals. Animals have feelings. They have the same mind as we have, and also want happiness, like we do. For example, if you suddenly touch them, they are immediately frightened. They get frightened if somebody beats or hits them with a stick. We also get frightened. If somebody throws cold water on our body, suddenly we feel a shock. It is the same for animals. They have the same mind, and it is very important what happens to them. Even if they can’t speak, can’t express themselves, animals can show their fear through their body. For example, they try to run away. Human beings can talk and complain, and they can bring court cases. Human beings can report things to the police. Human beings can do so much, but animals can’—they can do nothing. They can’t express their suffering. Human beings can talk about their fears. Whether other people accept your suffering or not, at least you can explain it and the other person can hear. Animals can’t, but you can see how they feel from their movements. If someone tries to attack them, they run away. They are afraid, which means they want happiness and not suffering. This is a very important point, that they have the same mind as us. If you kill them, you create the negative karma to be like them. For one hundred thousand lifetimes, you will have the karma to be born as an animal. For many thousands of lifetimes, you will suffer the consequences. It is said in the teachings that if you kill one animal, because of that karma, you will be killed five hundred times by others. You will suffer in very hot hell realm for one thousand eons. It is also good to ask yourself how it would be if somebody killed you with a knife. How would you feel in that situation? For example, if you put your finger in hot water, can you bear that? You can’t bear it. It’s the same when you kill animals. There is no good result from it. There is no question about that. Rinpoche gave the following advice to a student who had a pet snake, to whom he fed live mice. I have something to talk to you about, heart to heart, dealing with the suffering of animals. I heard that you have a pet snake, and that you have to feed the snake with mice. As you love the snake, of course you also have to love the mouse. The mouse is also looking for happiness and doesn't want to suffer. The mouse needs love from you, and wants help from you. Also, it is mentioned in the teachings of the Buddha about the karma of killing. If you kill one sentient being, then for 500 lifetimes you will be killed by others. This is the result of one negative karma of killing. 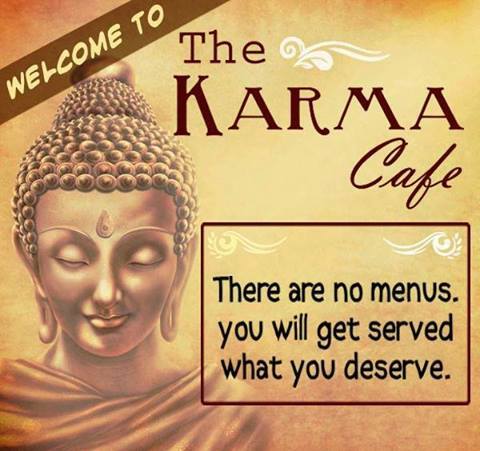 This is also explained by the fact that karma is expandable. If you plant one Bodhi tree seed the size of the tip of your finger, then from that comes many thousands of branches. All of that comes from one seed. Huge trees all grow from small seeds. So, you can get extremely large results from one small cause. In terms of our inner evolution, the effect is much greater. Not only does one suffer for many lifetimes, but the negative karma of killing obscures the mind. It becomes an obstacle to developing loving kindness and compassion for living beings, to developing the altruistic mind to attain enlightenment in order to liberate sentient beings, and to achieving liberation by removing the gross and subtle obscurations and therefore to achieving enlightenment. Therefore, we can’t do perfect work for sentient beings by freeing them from suffering and bringing them to enlightenment. All of this comes from negativity such as killing. Because the motivation is non-virtuous, then the action becomes non-virtuous, negative karma. This obscures the mind, and then it is difficult to see the reality, the ultimate nature of the “I,” and the nature of one’s own mind. One is unable to realize this. Without the wisdom realizing that nature, there is no other realization that can illuminate the root of the sufferings of samsara, and the root of delusion and karma, that ignorance of not knowing the nature of the self and mind. Without that wisdom, you can’t cut the root of samsaric suffering, the cause and there is no way to liberate yourself from delusion and karma—no end to samsara. You have to suffer endlessly. Then, you can’t liberate others from samsaric suffering and its cause. So, if you have to take care of the snake, and the snake doesn’t eat vegetarian food, you have to engage in killing. That is discriminating. You give love to the snake but not to the mouse. They all want happiness and do not want to suffer, and they all want you to give them love. If you let the snake go, it will kill other animals. The solution, either way, is problematic. The solution is to develop your mind on the path as quickly as possible, to liberate yourself from karma and delusion, enter the Mahayana path, and eliminate the subtle defilements so you have omniscient mind and are able to read all sentient beings’ minds. You are able to see their karma, wishes, characteristics, level of intelligence, and are able to see directly all the methods to help them. You have perfect power, and compassion for all living beings without discrimination. You can do perfect work for all sentient beings. You can liberate them by having all the means, especially bringing them from happiness to happiness, up to full enlightenment. You don’t have to reincarnate again and again in samsara and experience so much suffering of hunger, thirst, hot, and cold. Meditate on the fact that all happiness depends on so many sentient beings. For example, when a house is built, many worms and ants have to be killed. Many hardships are experienced by those beings. 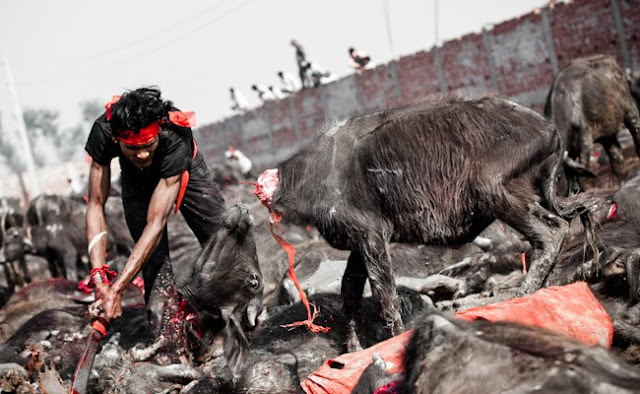 Again, for food and clothing, many beings have to be killed. For one plate of rice, so many beings have to be killed. It is the same with our clothes made of silk or animal skins. Many beings have to suffer for our comfort and survival. If you liberate yourself and don’t have to reincarnate, then there is so much relief for sentient beings, so many sentient beings don’t have to suffer. You are liberated from samsara, and you are freeing other beings from having to suffer. By revealing methods, especially by revealing Dharma, you can liberate many beings and bring them to enlightenment. The conclusion is that we can do practices now to liberate these animals from the realms of suffering. It is the same for hell beings and hungry ghosts. This is the solution, so that they don’t have to suffer for a long time through killing each other. We should focus on this method to liberate these beings as much as possible, so they don’t have to suffer. This is only through practicing Dharma. This is my advice to you. Probably the best thing is to let the animals go and pray for their higher rebirth. You can do meditation practice to purify negative karma and pray for higher rebirths. You can chant the five powerful mantras and dedicate them to their higher rebirth and to meeting the Dharma. This is one small example of how you can benefit them. Practice not harming others, and benefiting them as much as one can. You can reveal the wisdom of Dharma and educate other people in this way. This brings peace and happiness to oneself and others. You and others don’t have to be born in the lower realms. Even if they aren’t liberated from suffering and its causes and don’t get enlightened in this lifetime, they can still achieve all the causes enlightenment in the future. So, please practice compassion for others. From that comes not harming others, and the thought to benefit others. Since you are a good-hearted, good-natured person, this is my humble advice to you. 1. You are never born in the lower realms. 2. You will have continuous material and mental prosperity. 3. You will be born as a wheel turning king in future lives for thousands of eons (according to the life of a deva, which is much longer than a human life). A wheel turning king has the most power and wealth in one universe. He is unique in that universe, the only one. 4. You will abide in the 10 virtuous actions. 5. Even if you are not enlightened during Buddha Shakyamuni’s time, you will be born as one of the first disciples at the time of Maitreya Buddha. You will receive a prediction of your enlightenment from Maitreya Buddha. Sooner or later you will achieve enlightenment. Reciting this mantra would be most beneficial for all beings, not just your snake. Another mantra to recite is the Stainless Pinnacle mantra. It is extremely powerful and also a great healing mantra. If a fully ordained monk broke his root vows and was destined to go to the lower realms, this mantra would release him from the lower realms. Buddha Shakymuni told Ananda that anyone who hears the Medicine Buddha mantra would not be born in the lower realms. Reciting it every day frees you from all suffering and brings every benefit, including success in this life, up to enlightenment. The essence of the Buddha’s 84,000 teachings are the teachings of the Prajñaparamita—this is the heart of the Buddha’s teachings. There are many volumes in the Prajñaparamita, the elaborate version which has 12 volumes, the middle version which has 3 volumes, and the short version which has 80,000 stanzas. The very heart of it is called the Heart of the Wisdom. This is the teaching that Buddha cherishes the most because it is the method to release sentient beings from the suffering of samsara, and its root: ignorance. When you have time it is good to recite the whole prayer. If not, then just recite the mantra. Also, to help guide you on the foundation of the path to liberation and enlightenment, it is good to read any of the short lam-rim prayers, to plant the seed of the whole path. Another way to benefit animals is to take them around holy objects, such as statues, stupas, and scriptures, especially those containing relics and mantras. Take your snake around these holy objects as much as you can. Make prayers to achieve bodhicitta for the snake and all sentient beings. Make a prayer to realize emptiness. “Due to the merits of the three times created by me, buddhas, bodhisattvas, and all other sentient beings, wherever I am—whatever universe, world, country, area, or place, just by my being there in that universe, world, country, area, or place, may those beings purify their negative karma and never be born in the evil realms. May this cause them to have faith in refuge and karma, and to generate loving kindness, compassion, and bodhicitta immediately in their hearts, and immediately heal all their sickness and free them from spirit harm. May it cause great bliss in the hearts of those affected by depression, and people suffering from relationship problems. May it fill up their hearts with incredible joy, and all peace and happiness. And may it cause them to have a most meaningful life by actualizing the path. May suffering be pacified, and those needing money find wealth. May they realize that the purpose of their lives is to actualize the path to enlightenment. May those looking for a guru find a most qualified guru and those wanting teachings receive perfect teachings and achieve realizations. May those wishing to do retreat find a place to meditate and achieve all realizations. May they never experience war, disease, torture, poverty, the dangers of fire, water, earthquakes, and all natural disasters. May I become wish-fulfilling for all sentient beings. May nothing become negative karma, and everything become Dharma. May all beings achieve enlightenment quickly, by actualizing the path. Due to the merits of the three times created by me, buddhas, bodhisattvas, and all other sentient beings, which exist, but do not exist from their own side, may I, who exists, but does not exist from my own side, achieve Guru Shakymuni Buddha’s enlightenment, which exists, but does not exist from its own side, and lead all sentient beings, who exist, but do not exist from their own side, to enlightenment by myself alone. That I may follow their perfect example. By circumambulating animals around holy objects and reciting mantras to them, we help them achieve good rebirths, meet the teachings, achieve liberation and then enlightenment. They can purify every trace of negativity, the seeds and their imprints. They are able to complete all the realizations of love, wisdom, and power, and so do perfect work for others. You should recite prayers and mantras verbally, aloud, so that they leave positive imprints on their minds, to help them achieve enlightenment—that which is the cessation of all stains of the mind, gross and subtle, and completes all the realizations—the fully perfected state of mind, peerless happiness. It would be much better to buy meat from a shop for your snake. You could try to disguise it is a mouse, and although the snake still has some karma of killing, it would not be complete. Also, if you give a toy mouse to your snake, he might learn that mice are no longer edible, and maybe he will not want to eat them any more. I hope you don’t collapse or faint, overwhelmed with all this advice.